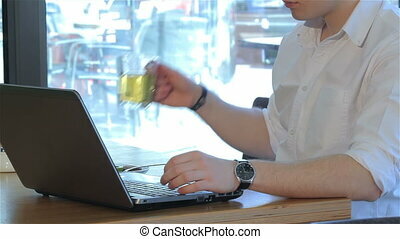 Businessman with a laptop and tea looking at his watch. 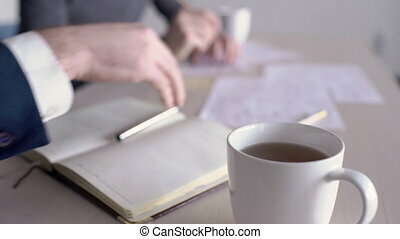 White cup with tea on background of working people at the desk. 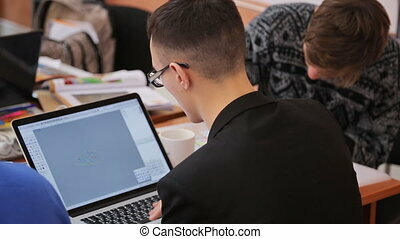 During work man's hand in suit takes a mug with a drink to quench his thirst with a continuous brainstorming session with co-workers at table. Business lunch at the wooden square table. On the table laid paper is a tablet with graphs and tea in white mugs on a plate. People communicate, gesturing with his hands, drink and shake hands. 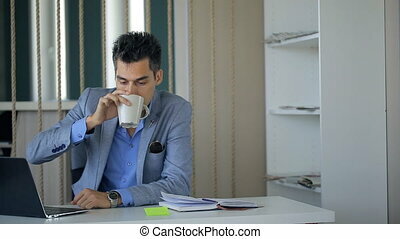 Business man is taking coffee break sitting at workplace continuing working. 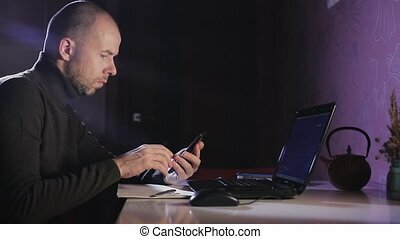 Young handsome man is typing something in laptop deciding company problems and issues for future development drinking coffee. He is wearing short black hair, classic grey jacket with golden decoration on lapel and sunglasses in pocket, steel massive watch and sky blue shirt. Workplace is about notebook and sticker with notes, shelves of grey and white colors with colorful files.